With just the right balance of tart and sweet, these are a fun and refreshing summer treat that appeals to the whole family. Preheat oven to 350°F (180°C). Prepare a 12-cup muffin tin by lightly misting with cooking oil spray. Chop apples and place with water in a saucepan over medium heat. Cook until they can be mashed/stirred into a puree. Remove from heat and set aside. In large mixing bowl, beat eggs. Add granulated sugar, milk, oil, lemon juice and 3/4 of the pureed apples and blend well. Add flour, baking powder and salt and mix well. Set aside. In small bowl, combine the berries, icing sugar, melted margarine and remaining apple puree. Set aside. Fill each muffin tin halfway with batter. Place a spoonful of the berry puree on each cupcake and top with remaining batter. Bake for about 18-20 minutes or until cupcakes spring back when touched. 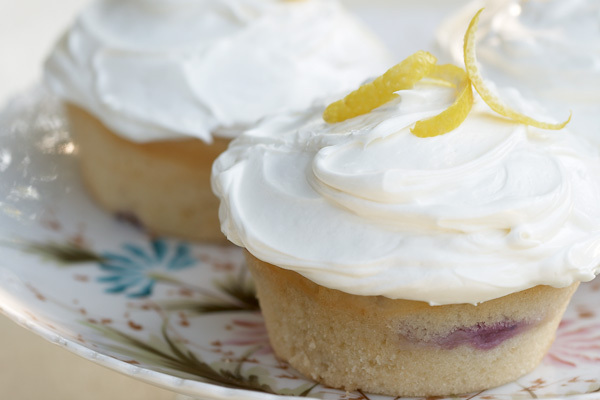 These cupcakes can be topped with a sprinkle of icing sugar or cream cheese frosting.